Air plants are the hottest new thing in houseplants. House & Garden Magazine's Stephen Orr visits The Saturday Early Show with tips on caring for these tropical treasures. Air plants absorb their nutrients through their leaves, allowing them to grow without soil. There are more than 400 perennial species of air plants. Most varieties bloom for one to several months from late fall to spring. Some bear fragrant flowers that attract moths and butterflies. Meanwhile their vivid, usually reddish color often appeals to hummingbirds. Tillandsias are some of the most unusual air plants in the world. In the wilds of South America these bromeliads (from the pineapple family) are able to grow on a rock or tree, far from the soil that most plants require. In the wild they get all of their water and nutrients from rainfall. Most homes are too dry for air plants, and contrary to much of the advice you might hear on caring for air plants, Steve Orr says misting them does not provide enough moisture for indoor plants, even if it's done daily. He says the best way to water air plants is to soak them in a siinkful of water overnight, every two weeks or so. 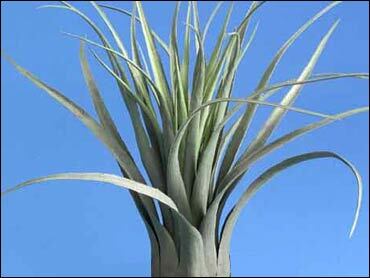 Air plants with gray and thick leaves need more light than the green variety of the plants. But, too much sun or cold can be harmful to the plant. The air plant should be kept at a temperature above 40 degrees. Also, bright and indirect light is best for the plant during the hot days of summer, while the direct but less harsh sunlight in winter is fine. Orr recommends displaying air plants on top of vases or bowls. They are often mounted onto boards or pieces of driftwood. Some can hang, as long as you are able to take them down every week or so to water them. Some species make ball-like shapes when they are hung. Fertilizer isn't necessary for air plants, but if you want to grow bigger plants and flowers, add a few drops of Miracle Grow to the soaking water once a month. Steve Orr suggests purchasing air plants from Bird Rock Tropicals in Carlsbad, California. Its phone number is (760)438-9393. Another source for the tropical plant is Rainforest Flora Inc. in Torrance, California. Its phone number is (310)370-8044.